This was quite the process! 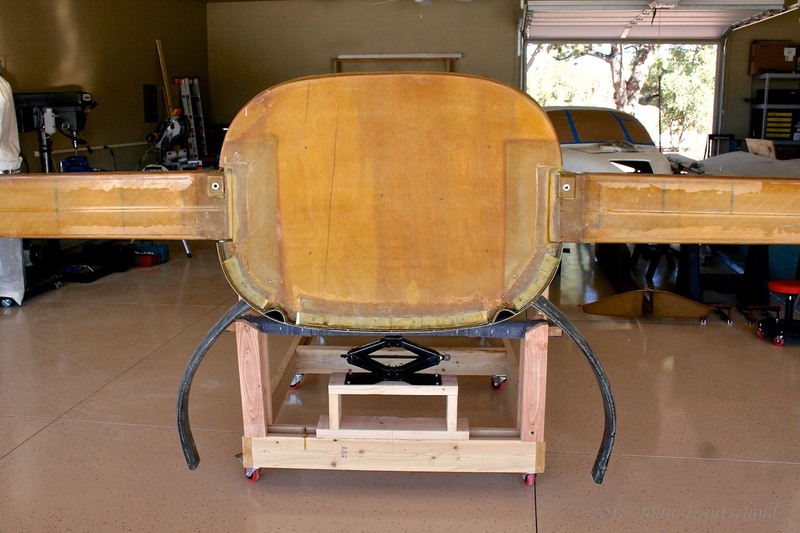 The hardest part of it was raising up the aft end of the fuselage high enough so that we could rotate the gear leg in. The manual says to rotate the entire lower fuselage sideways. Well, how the heck can you do that with the main spar hanging out! I came up with a better way (well, easier, perhaps) and along with the help of some local EAA buddies, we managed to get it done in about an hour. See the process in the main section. The first step is to locate the opening for the main gear leg. The factory provides a template for that. Once again, it’s time to cut holes in that fuselage - always a bit on the precarious side because you definitely don’t want to mess this up! 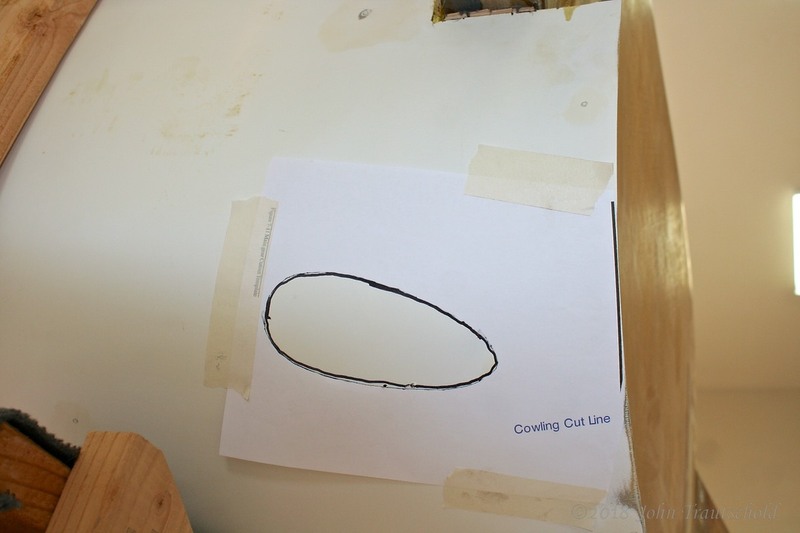 The reference for the template is the cowling cut line, which is easy to see in the photo, and a reference line created inside of the fuselage using the conduit. The manual says to mark the line, then shine a bright light through so that you can see it on the outside. Hah! 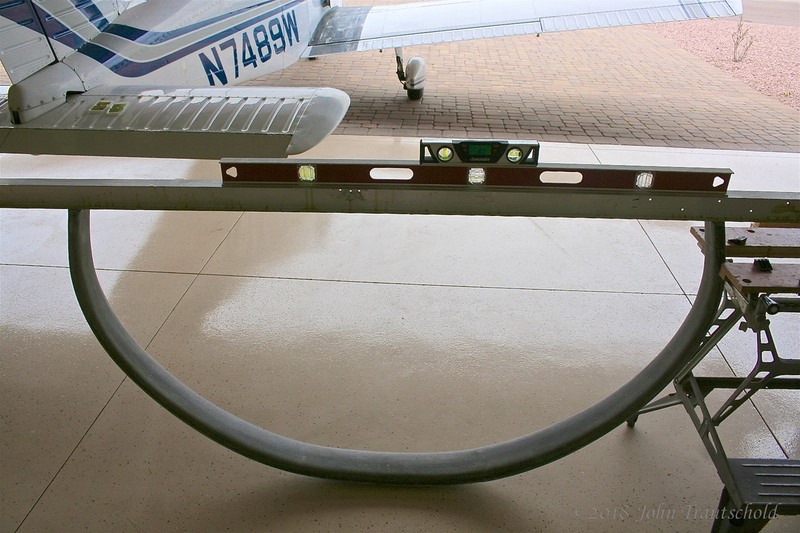 I used 1000 watts of light and even that wasn’t enough to shine through the fuselage and the layups already in place. So I took a small drill bit and drilled some reference holes from the inside out. that worked perfectly. You can kind of see those holes at the bottom of the template. Scary cut time again - Marking and cutting holes into the fuselage for the landing gear assembly. The factory makes the leg assembly in the factory. However, I need to find the exact center of that leg for installation. So, I took one of the i-beams and placed it across the bottom of the leg. I’m using my handy Black & Decker Workshop Table (on the right) to hold the leg in place. To find the center, measure the length and divide by two! I then dropped a plumb bob from that center point to locate the center on the leg. Naturally, the leg itself needs to be leveled before I can accurately find the center. I marked that location with masking tape - not shown here in the photo. Checking for level so that we can find the exact center of the main gear leg. Time to enlist the help of some local EAA buddies here in the airpark. 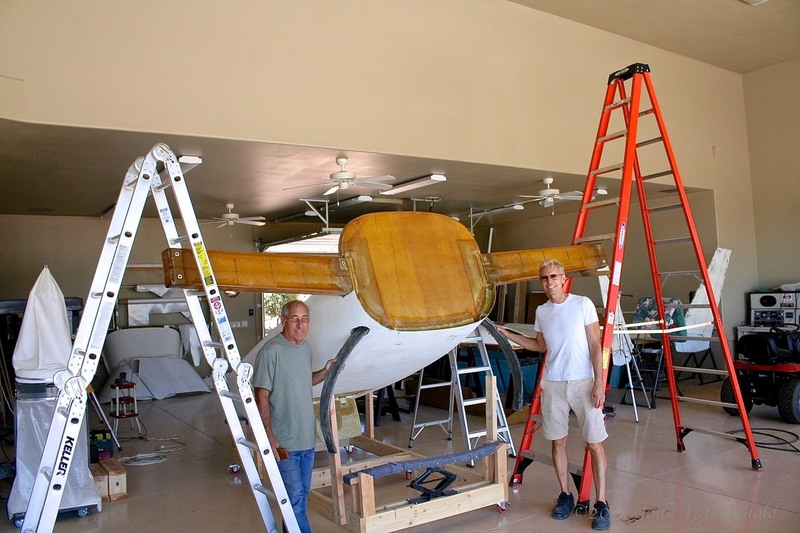 Ken (left) and Tom (right), along with the help of a couple of my tall ladders, helped to lift the aft end of the fuselage up high enough so that we could rotate the gear leg in. Tom is a tall guy (taller than 6’) so you can see how high we needed to lift that thing off of my carriage. It still took another good half hour or more to get the leg in since I needed to open up the leg holes a bit for clearance (which the book said most likely would need to happen). As you can see, we did it. I bought them both lunch at our local airport restaurant (Crosswinds) after that project! EAA Chapter buddies Ken Rice (left) and Tom West (right) helped lift the rear end of the fuselage up so that we could install the main gear assembly. Job complete and now the back end is happily resting on the cracle once again. Back down to earth! Next step is to lock that assembly into place. The next step is to lock the main gear leg into place in the fuselage and that process begins here.